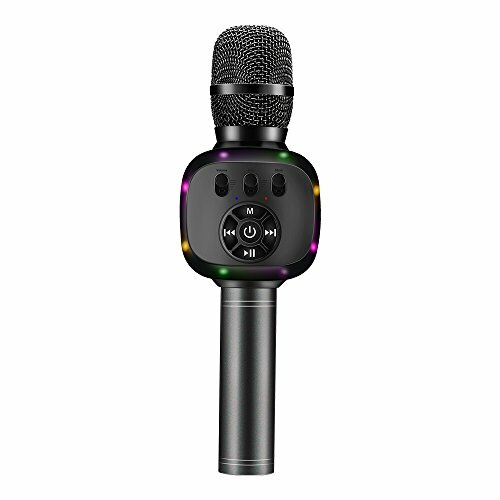 ♪ 【Fullly Upgraded Mic】- This wireless mic is designed with LED light in both front and rear side, 6 full colors, 7 colorful dynamic breathing lights, great for party, interview, travel, festivals. ♪ 【Perfect Duet】- Compatible with iPhone, iPad, PC, Android, the bluetooth mic can be paired with 1 more mic at the same time. Sing and share pleasure with families and friends. ♪ 【Accompaniment for Recording】- BONAOK microphone supports singing with lyrics or accompaniment, prefect for you to record freely. ♪ 【Superior Louder Speaker】- Super powerful speaker for being heard, DSP technology and 3-layer filter to avoid popping. Inserting a SD card or paired with car/phone, the karaoke mic is a moving amplification. ♪ 【Supports AUX Connection】- The portable microphone can be paired with your own amplification with an AUX cable, in great reverberation and louder sound. A live show everyday.